Close your eyes and remember what it was like to fall in love for the first time. The rapid heart-thumping. The sweaty nervous energy. The completely irrational jealousy. The feeling that nothing else in life matters. The exquisite coming-of-age drama Call Me Your Name captures all those emotions. And it does this with a deep, heartfelt sensitivity. It’s the definitive love story of the year that just happens to feature two guys front and center. Now that the scene is set for utter intoxication, let’s meet our leads. Elio (Timothee Chalamet) is 17 years old and living with his professor dad (Michael Stuhlbarg, Steve Jobs) and mom (Amira Casar) at their country house. ‘Tis the season for the introverted Elio to noodle on the piano, read books, swim, bike and sleep. No responsibilities, no cares in the world. Elio’s lazy summer becomes upended with the front-door arrival of Oliver. A 24-year-old strapping American who looks exactly like Armie Hammer, Oliver is a doctoral student in town to assist the professor with his research. He’s gregarious, cocky, athletic and charming. In short, everything Elio is not. And boy does Elio know it. The two start off as fast friends. Oliver and Elio hang around the estate and get to know each other. The more time they spend together on the sun-kissed beaches, the more Elio becomes besotted by this suave house guest. Entanglements with local girls don’t seem significant. Only their chemistry smolders. And an endearing and highly clandestine relationship soon develops between the two men. Wait, strike that. The word “men” is inaccurate. Elio is still a teenager on the brink. He’s not yet aware that the gentlest of crushes can quickly turn crushing. Both actors are wonderful as they navigate their budding bond. For those unfamiliar with Chalamet, he’s a 21-year-old native New Yorker who plays the oversexed high school jerk in the equally great Lady Bird. 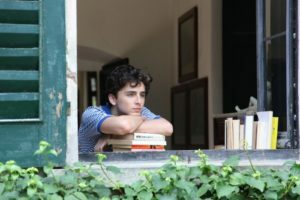 A total acting natural, he imbues Elio with a sense of immature impetuousness and boyish soul. You will care about him. I met Chalamet briefly at January’s Sundance Film Festival and was struck by his old-soul maturity. Glad he’s being touted in the Best Actor category on the awards circuit. He deserves it. As for Hammer? This is the role the handsome actor was born to play. Even more so than the intimidating Winklevoss/Winklevii twins in The Social Network. His confident dance moves in pink short-shorts to a Psychedelic Furs New Wave classic alone is swoon-worthy delight. Now, about that aforementioned peach. Think American Pie. . . . except 100 percent different in terms of tone. It’s the most creative sexual use of a fruit since. . . well, since Tiffany Hadish got handsy with a grapefruit in Girls Trip. But if you’re going to rave about a particular scene, be sure it’s the truly sweet one. 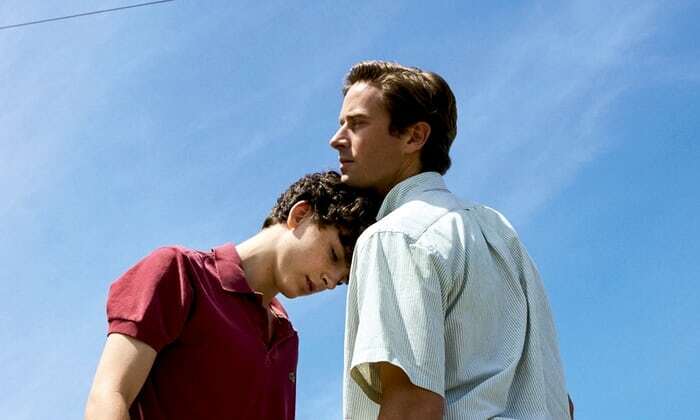 Deep in the third act, Elio’s dad, sprawled out on a couch, delivers one of the moving — and unexpected — monologues I’ve ever heard about love and loss and moving on. It took my breath away. Sometimes parents do know best (and do know all). Luca Guadagnino, who previously directed the sumptuous A Bigger Splash, designs Call Me Your Name into a gorgeous, meaningful postcard. Watching it is like finding a treasured artifact from your youth, back when withering looks felt like daggers to the heart. Like most summer flings, it’s painfully obvious that Elio and Oliver’s intense fire is destined to flame out. Enjoy being in the moment while it lasts.